Ever tempted to see how the tracks and approaching stations appear to Metro drivers? Commuters will soon be able to experience it with the Delhi Metro Rail Corporation (DMRC) launching new swanky ‘driverless trains’ that will accommodate passengers end to end. Investing in sustainable transport infrastructure is something national and local leaders want as a way to cut climate-warming emissions – 23 percent of the global total – generated by the world’s transportation systems. But it has become a daunting prospect due to the public perception that it’s prohibitively expensive. New research that compares both high-carbon and low-carbon paths for transportation shows that public perception is mistaken: a low-carbon investment strategy is actually more affordable than the carbon-intensive way. The potential savings could be $300 billion each year and is within existing financial flows. The rest is randomly dumped in rivers, seas, lakes and wells, polluting three-fourths of the country’s water bodies, according to an IndiaSpend analysis of various data sources. An estimated 62,000 million litres per day (MLD) sewage is generated in urban areas, while the treatment capacity across India is only 23,277 MLD, or 37% of sewage generated, according to data released by the government in December 2015. Further parsing of this data reveals that of 816 municipal sewage treatment plants (STPs) listed across India, 522 work. So, of 62,000 MLD, the listed capacity is 23,277 MLD but no more than 18,883 MLD of sewage is actually treated. That means 70% of sewage generated in urban India is not treated. While 79 STPs don’t work, 145 are under construction and 70 are proposed, according to the Central Pollution Control Board’s (CPCB) Inventorization Of Sewage Treatment Plants report. India’s towns and cities contaminate their own water, with no improvement over the years. Sewage generation in India from class-I cities (with a population more than 100,000) and class-II towns (population 50,000–100,000) is estimated at 38,255 MLD, of which only 11,787 MLD (30%) is treated, according to the Faecal Sludge Management report by Water Aid, a safe-water and sanitation advocacy, quoting a 2009 CPCB report. The untreated sewage is dumped directly into water bodies, polluting three-fourth of India’s surface water resources, the FSM report said. Up to 80% of water bodies could be polluted, the report said. Operation and maintenance of existing treatment capacity is below par, with 39% plants not conforming to environmental rules for discharge into streams, the CPCB’s 2009 report said. An estimated 75% to 80% of water pollution is from domestic sewage, discharged untreated into local water bodies. Uttar Pradesh has the most working STPs, 62, followed by Maharashtra (60) and Karnataka (44). About 17 million urban households lack adequate sanitation facilities in India, with 14.7 million households having no toilets, the FSM report said. If you consider five people per family, that means about 85 million people–or more than the population of Germany–are without adequate sanitation in urban India. In terms of rural households, only 48.4% (87.9 million) have toilet facilities as on December 7, 2015, according to a reply in the Lok Sabha, the lower house of parliament. Around five million (7.1%) urban households having pit latrines that have no slabs or are open pits, and about 900,000 toilets dispose off faeces directly into drains. Only 32.7% of urban households that have sanitation facilities use toilets connected to an underground sewage network. As many as 30 million urban households (38.2%), of the 79 million households with septic tanks, have no clear method for sewage disposal. About 12.6% of urban households defecate in the open. This number is higher for slums, with 18.9% of households defecating in the open. Around 1.7% of households across India defecate in the open despite having toilets, the government informed the Lok Sabha in a reply last month, based on the National Sample Survey report 2012. In Madhya Pradesh, around 22.5% urban households defecate in open spaces, followed by Tamil Nadu (16.2%), Uttar Pradesh (14.8%), Gujarat (8.7%), Maharashtra (7.7%) and Delhi (3%). As many as 55% of rural households defecate in the open, according to data tabled in the Lok Sabha on May 7, 2015. Odisha tops list, with 86.6% of rural households defecating in the open. In Kerala, no more than 3.9% of households defecate in the open. The proportion of people practising open defecation globally has fallen almost by half, from 24% in 1990 to 13% in 2015. About 68% of the world’s population had access to improved sanitation facilities, including flush toilets and covered latrines, in 2015, according to the World Health Organisation (WHO). However, nearly 2.4 billion people across the world lack basic sanitation facilities, such as toilets or latrines. Of these, 946 million defecate in the open, according to the WHO. The Swachh Bharat Mission, launched by the National Democratic Alliance government on October 2, 2014, aims to make India open-defecation-free by October 2, 2019. The government plans to construct 2.5 million individual household toilets in urban areas by 2015-16, of which 882,905 were constructed upto December, 2015, according to latest data available. As many as 32,014 out of 100,000 community and public toilets have been built under the Swachh Bharat Mission. The rural sanitation programme, in its first year, saw the construction of 8.8 million toilets, against the target of 6 million. 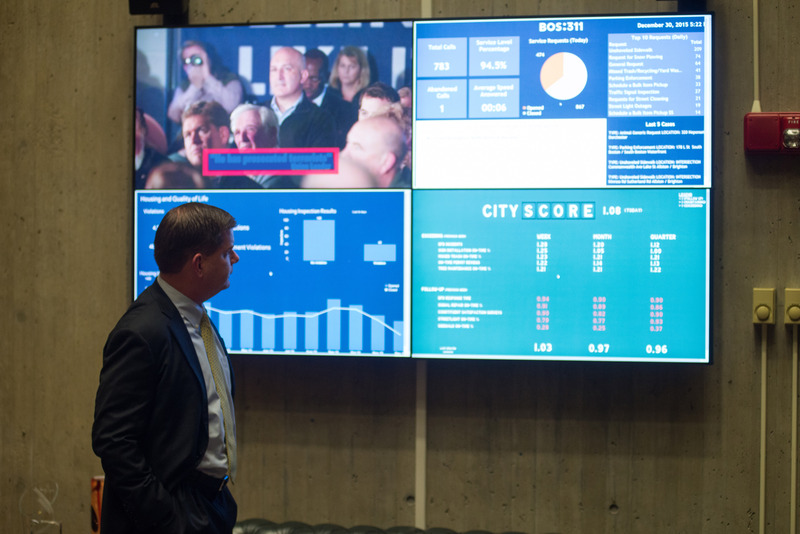 MARTIN WALSH, THE mayor of Boston, keeps on top of what is going on in his city. His office is dominated by a dashboard, a large screen packed with constantly changing snippets of text, numbers and charts (pictured). One section shows the current traffic to the city’s call centre and the percentage that has been answered within 30 seconds. Next to it is a chart tracking the number of potholes filled every day, which makes way for a map of Boston’s neighbourhoods coloured according to how often Mr Walsh has visited them.